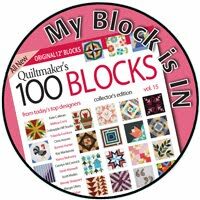 Quiltmaker's 100 Blocks Volume 9 Blog Tour! 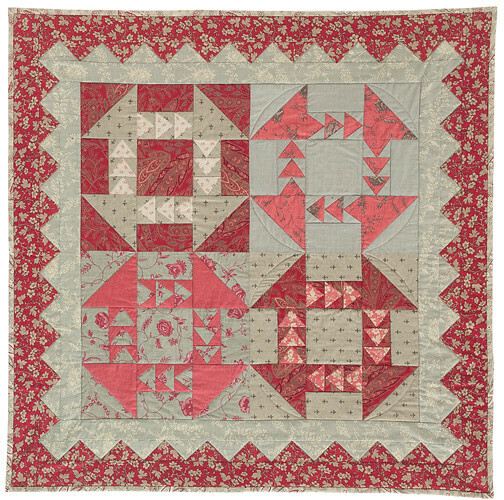 Dashing Geese is a combination block containing a small bit of paper piecing for the geese units and regular piecing for block construction. You can read a bit about what inspired me to try designing a block here. I had so much fun coming up with a design. 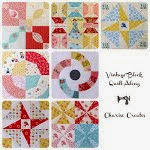 To begin the process I thought about what kind of quilt block I am drawn to...often these are traditional blocks with a history to tell. I selected the churn dash. 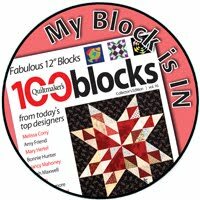 Next, I considered what I could do to make this block my own. The churn dash has great possibilities when you consider the "real estate" available in the rectangular areas of the block. Mulling over the options I decided to fill the rectangles with flying geese. Due to the dimensions of a churn dash I could not use the 1:2 ratio of traditional flying geese. Instead, I drafted a paper piecing template to create the geese unit. I don't have special software and just used the Drawing toolbar of MicroSoft Word to work out the specifics. Dashing Geese wall hanging. 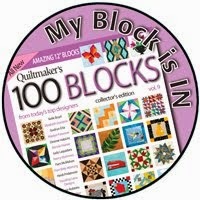 Photographed by Quiltmaker's 100 Blocks. 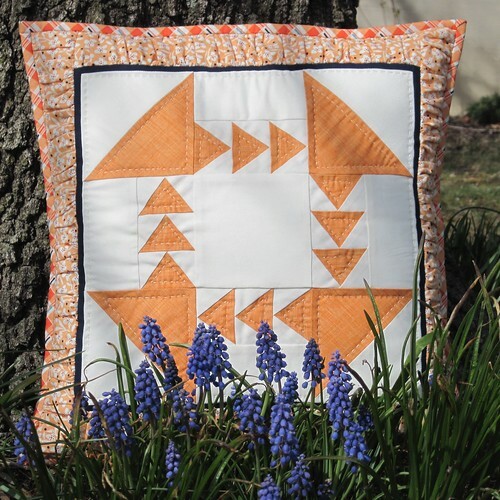 For this Dashing Geese mini quilt I used my all-time favorite fabric, Rouenneries by French General. 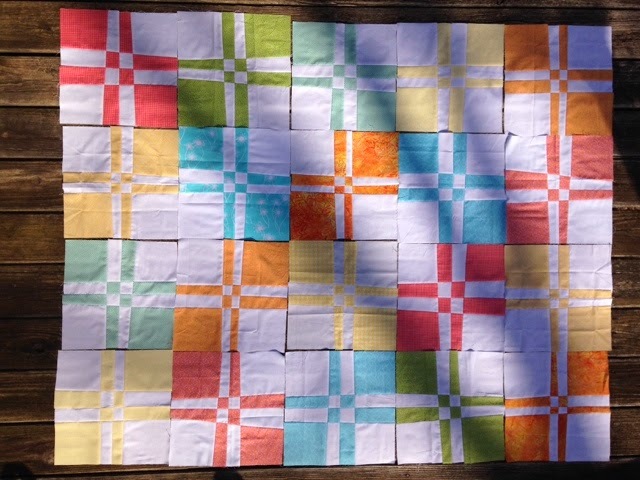 In each block I changed up the fabric placement or colors to create a sampler-style quilt. Magazine give-away! 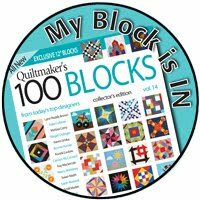 Quiltmaker's 100 Blocks, volume 9 goes on sale May 6, but Quiltmaker's Magazine is going to give one of my readers a free issue! 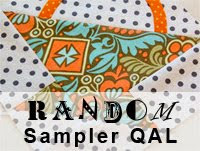 Just leave a comment telling me if you are a contemporary/modern quilter, or if traditional is more your look. 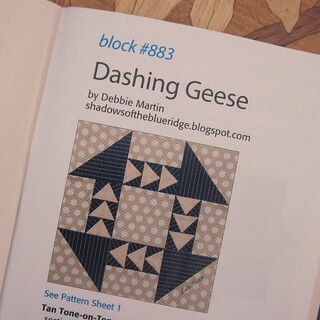 I'd also love to hear what fabric line and colors you'd use to make a Dashing Geese block...I'm always looking for creative options :o) This magazine drawing is open to everyone-international included. I'll use Random.org to pick the winners at 10:30 p.m. EST, Friday evening, May 2 for both the magazine and the Dashing Geese pillow. Check back on Saturday to find out who the winner's are. You must have an email account associated with your profile in order to win, if your account is a "no reply blogger" I have no way to contact you. 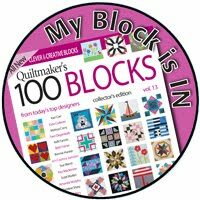 Make sure you stop by Quiltmaker's blog, Quilty Pleasures, for even more prizes, and a complete list of blog tour participants! Thank you so much for stopping by my blog and sharing in the fun! Here we are at the end of April...I can hardly believe it! 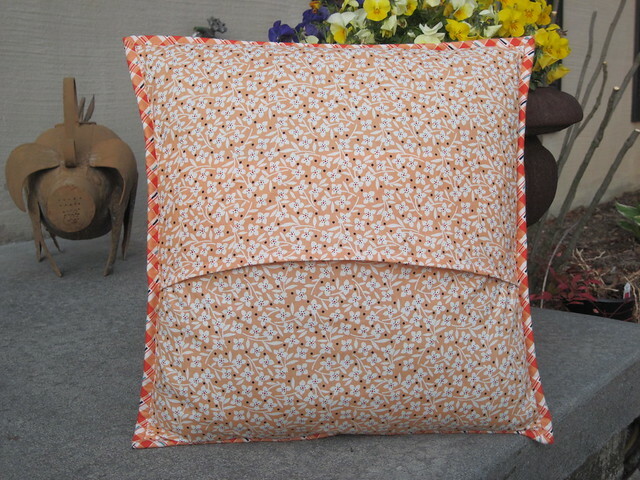 I am happy to report that I met my April ALYoF goal and finished the pillow :o) But goodness...I'm not quite sure how to document it just yet. 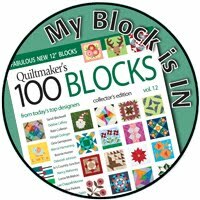 You see, it can't be shown until Wednesday when my blog participates in the Quiltmaker's 100 Blocks blog tour, because...well because it features my block!! 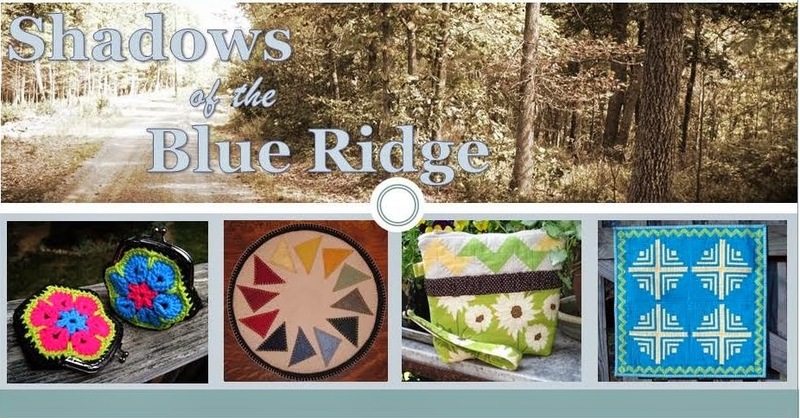 So I guess until that time I'll just have to show you the pillow back so you know it's all finished, and then the reveal will come on Wednesday during the blog hop :o) I'm linking up with the April Finishes Party and I'm entry No. 38. In other news: I've been working on the March quilt for the Faith Circle of do. Good Stitches. The wonky disappearing 4 patch blocks are all sewn together and now I'm making a raw edge applique border to go around it. Here's a progress shot to show how it's coming together. I am loving this quilt! When it's all done I think it will be so sweet :o) These wonky disappearing 4 patch blocks are made using my tutorial which can be found here. The flower and vine shapes come from The New Applique' Sampler by Piece O' Cake. This is a great book if you are looking to learn needle turn applique'. For this quilt I'm fusing the applique' pieces down and then will do raw edge stitching on my machine. 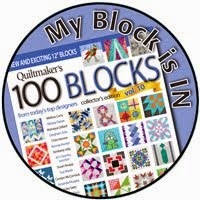 Hope you will stop back by on Wednesday, April 30 when my blog is a stop on Quiltmaker's 100 Blocks blog hop! There will be a fun give-away with prizes :o) See you then!! Birds are singing, the sun is shining, and a beautiful Spring Day is in it's infancy. It feels so good to be outside. Here they are all ready to be cut to size and stitched together. I love this gentle quilt already. Edit: Tutorial for this block can be found here. 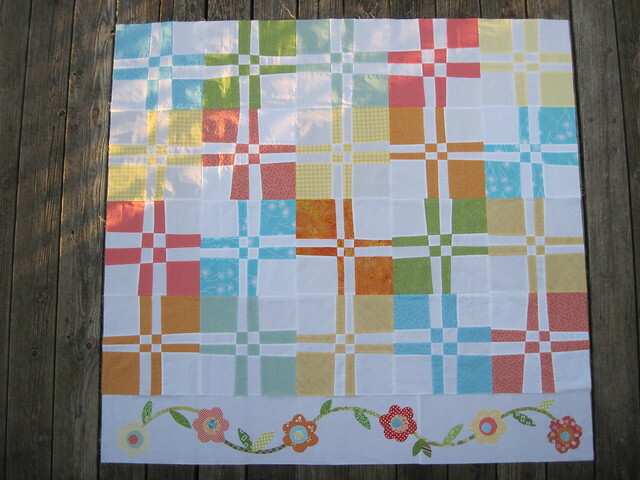 Labels: "Faith Circle" "Wonky 4 Patch"
April means we are ready for fresh, bright colors and flowers...right?! Thoughts of warm weather and spring clothes sound so good :o) It is so very nice to go outside without a winter coat on! 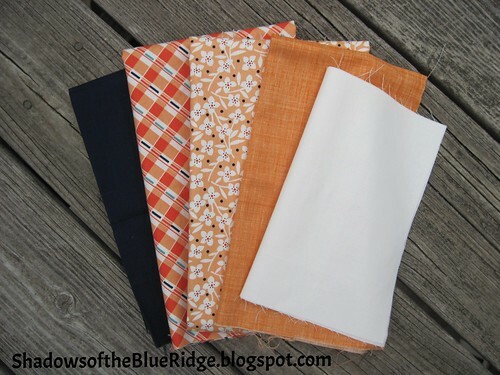 From left to right, Kona Navy, the plaid and floral prints are from the Blossom Reel line by DS Quilts, Color Weave by P&B Textiles in Light Orange, and finally Kona Snow.